Stroke. 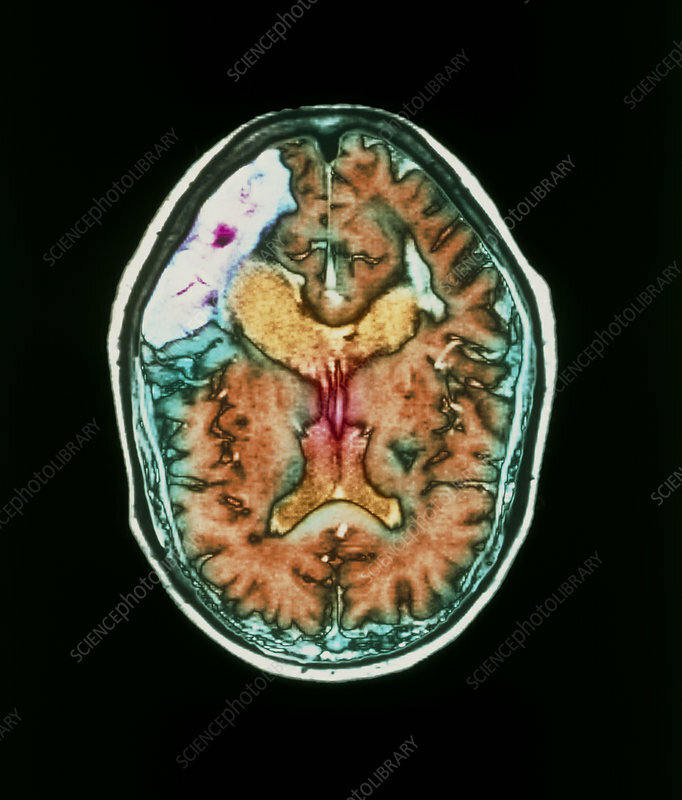 Coloured magnetic resonance imaging (MRI) scan of an axial section through the brain of a 72 year old woman, showing a haemorrhage that caused a stroke. A stroke is also known as a cerebro- vascular accident (CVA). Here, the haemorrhaged area (white) involves an occipital lobe of the cerebrum of the brain. Internal bleeding deprives this area of oxygen and has led to death of this brain tissue; healthy tissue is brown. Symptoms of a stroke depend on extent and location of brain damage. They vary from headaches and dizziness to paralysis and death. Strokes typically occur in the elderly, and are a major cause of death.